Friday 26 Apr - Latest - Tomy Foam Cone Factory is currently in good supply throughout the UK. Checkout the listings below for the latest deals and stock. 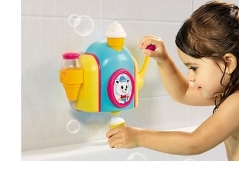 Bath time is fun again with Tomy Bath Foam Cone Factory! 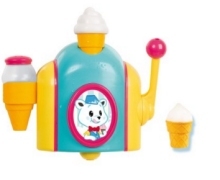 With it's suction pads attached to the wall or inside of the bath, add the bubble bath mixture and water and the kids can then create their own pretend ice creams by pulling the lever and holding a cone underneath. A shaker comes included so prentend sprinkles can also be added to finish the ice cream off. No batteries required. Suitable for ages 18 months plus. We constantly check for Tomy Foam Cone Factory stock, so you don't have to. Receive email alerts when Tomy Foam Cone Factory online stock is found.